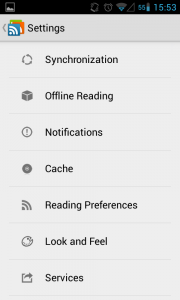 Google Reader is bidding us all goodbye. It’s hard to believe, especially when it’s one of the most popular and useful products Google has ever put out, but it seems like Google is phasing out their support for RSS and instead betting on social with Google+. 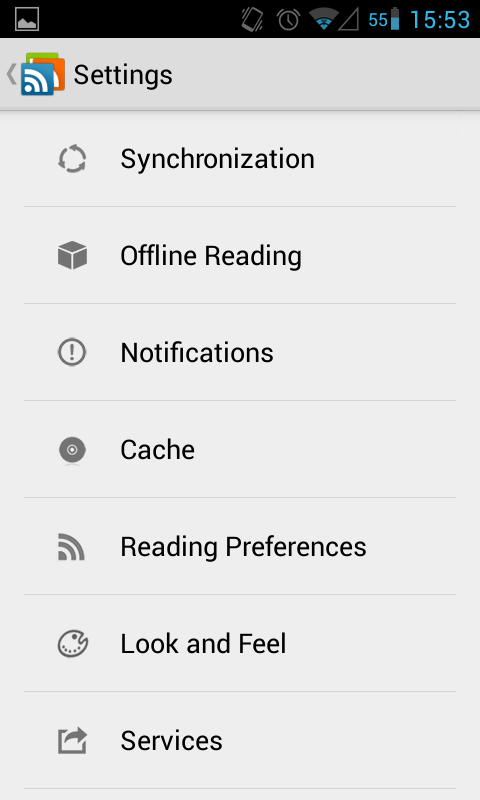 You should get ready, there are less than 8 days until Google drops Reader once and for all. The switch will affect not only Google Reader and the Android Google Reader app, but any products or apps that rely on the Reader API and haven’t switched to something else. So, here are a couple of solutions to help you getting ready for the switch on your Android device! Feedly is a great service that replicates a lot of the good ideas of Google Reader, while looking good and focusing on efficiency. Its intent to replace Google Reader has gone from subtle to obvious, by releasing a new API that basically clones the features of the Reader API, and which will be used to power a lot of alternative solutions in these coming weeks. 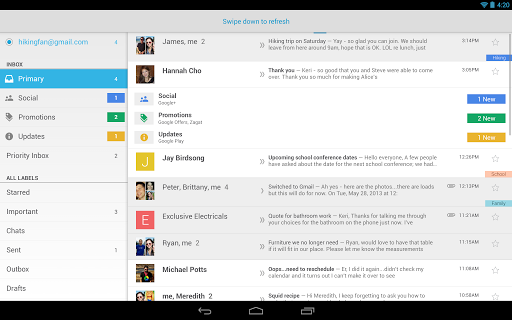 But, besides powering the API, it also has a pretty nifty Android client. It’s an app that has come a long way since its first release, and it shows an amazing amount of polish. It also has a very unique way of navigating through articles and categories, so don’t expect a native, Holo-esque app, because that just isn’t the case. 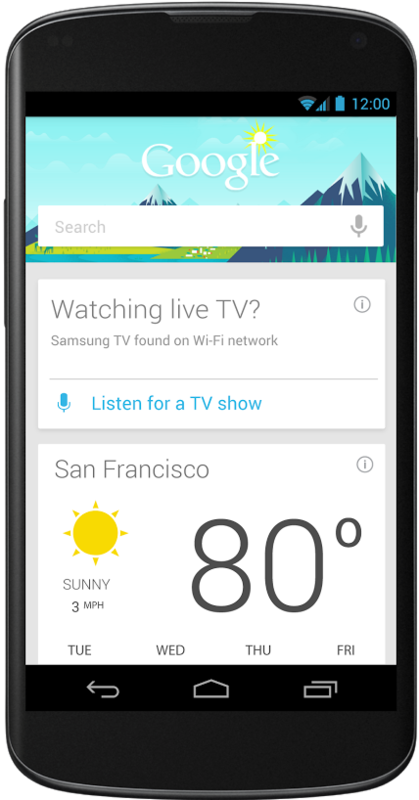 This is the main screen of the app. As you can see, it has a nice, simplistic design, and doesn’t look that exotic. 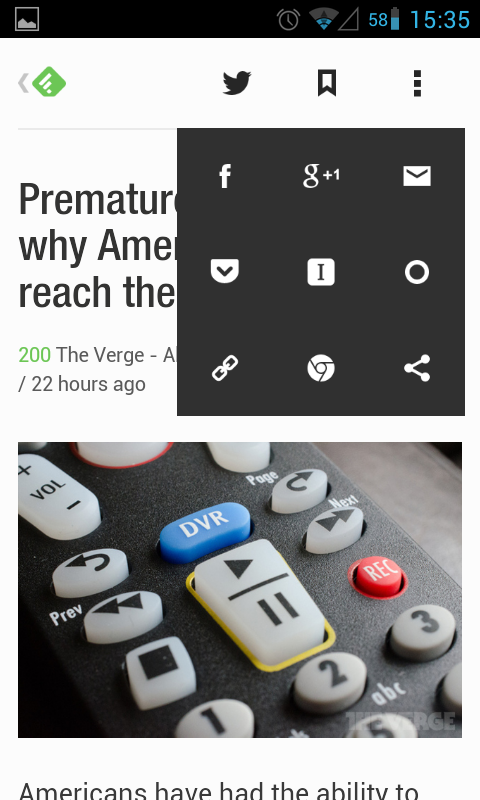 However, as soon as you try to scroll, you’ll see why this app is different. Its navigation works by “cards”, and as you flick up and down you’ll advance to the next set. It works, but it can be kind of jarring if you’re not expecting it, and to be honest adds very little in terms of features. Clicking an article takes you a clean view of the article, and it offers you a bunch of options to share it on multiple services. On the main view, you can drag from the left edge to show you all the categories, settings and saved articles, and from the right edge to show you a discovery screen. 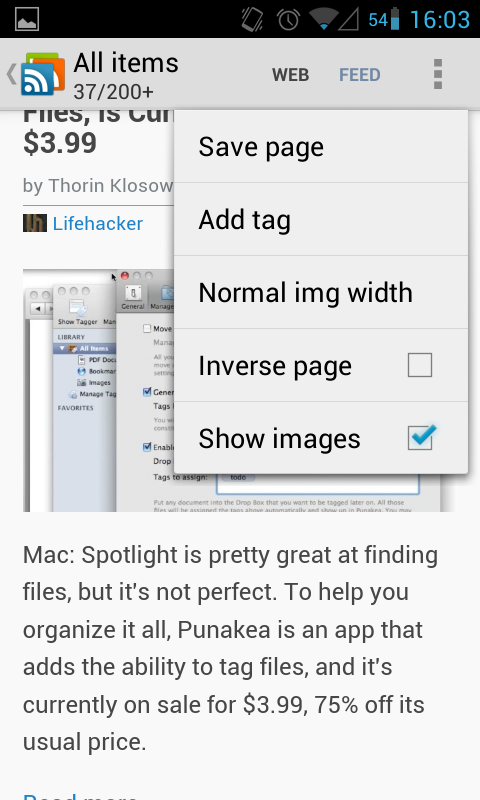 By the way, you can save articles by long pressing on an article during the main view. The Settings are pretty comprehensive. Clicking on them shows you some basic options, such as changing the theme and some options for content ordering. However, tapping on the Advanced Settings takes you to a proper Settings page with in-depth options, such as changing the transition style (for example, if you don’t like the way the navigation is done by cards, you can try a different style and see if it helps). Other options such as navigating with the volume buttons, Pocket integration and what view to automatically present when opened are very welcomed and make this a fairly customizable and reliable client. However, one thing it does not do, and which could be an issue for you, is work offline. The app has no offline support at all and will simply refuse to work without a connection, even for saved articles. 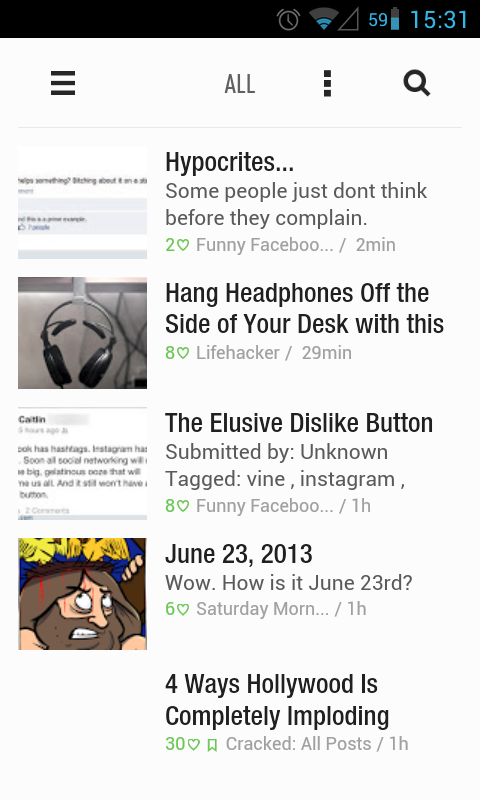 You can find Feedly though this link, absolutely free, and make sure to try the desktop version as well. The good thing about Feedly is, like I already mentioned, the fact that it will continue to work just fine after Reader dies. When you first use it, it will prompt you to import your feeds from Reader to Feedly, and from that point forward it will use its own API and not rely on Reader for managing your RSS subscriptions. 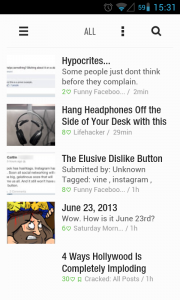 The API Feedly has created is going to power a lot of Google Reader clients in the future, including our next entry. All around just an awesome app, gReader is my RSS reader of choice for a number of reasons, but most of all it’s because it just stays out of my way and works behind the scenes to make my experience that much better. It doesn’t try to bother me with social features of anything like that, it just fetches my articles, downloads them, and lets me read them at my own pace, with a very simple and clean UI. 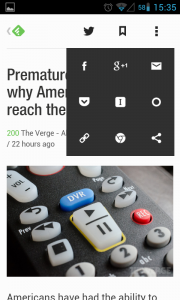 However, unlike Feedly, it does not offer a desktop client, so don’t count on it as a client outside of your Android device. As already mentioned, it is now powered by Feedly’s API (it used Google Reader’s API up until a couple of updates ago), so it will continue to work just fine after July 1st. 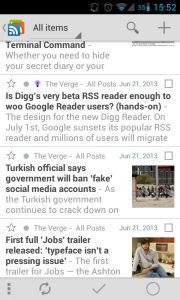 gReader looks simple, and somewhat like the official Google Reader client for Android. However, behind that simplicity, it hides a very capable and feature-rich RSS client that focuses on content first and foremost. By default, you are presented with the standard scrollable List view, with the title of the articles, a short preview of the article and the corresponding image. 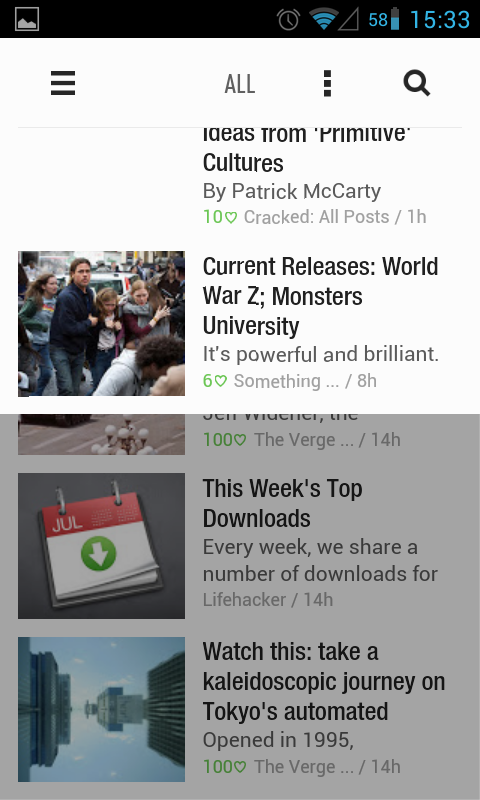 However, you can also switch to a more direct Grid view if you prefer your content that way. One of the features I like the most is that it automatically caches articles and allows me to read them later, even offline. Very cool to kill the time, or to catch upon the daily news on those days when there just hasn’t been enough time in the morning. 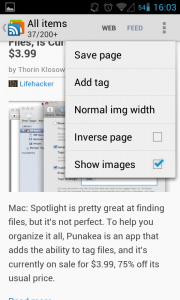 By default, it saves the text and title of the article, and doesn’t save or cache any sort of media such as images and video, but if you’d like a specific article to be fully downloaded, you can long press the article in the List or Grid view, and pick “Save page”. Another cool feature is that, in the article view, it allows you directly save the page, show or disable images and the very useful “Image width” option, which allows you to specify if the image should fit to the size of the screen or be displayed at full size, which is a godsend when reading comics or other content with small print. The Settings are pretty in-depth, properly categorized and offering tons of micro-managing. 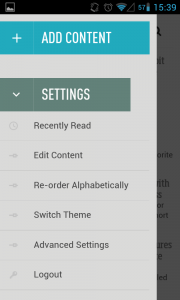 You can really get lost on these, but exploring the main sections you may find a useful feature or two that will improve your reading experience. Pretty much every facet of the app can be customized, from the general look to the way it handles text, so you can have some fun trying out and tweaking the app for your convenience. 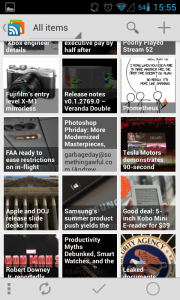 gReader has a very functional ad-supported free version, which you can find here. It also has a Pro version, which adds podcast support, a better set of widgets, voice reading and, of course, removes all ads. And that’s about it. These are the two apps and services I’m using to get by now that Google Reader has decided to leave us hanging. I think they serve the purpose, and to be honest in some cases even surpass the current features of Google Reader. Even if you do not decide to switch onto one of these two options, keep in mind, you only have until July 1st to make sure you backup your feeds and find a new client, otherwise you risk losing them. 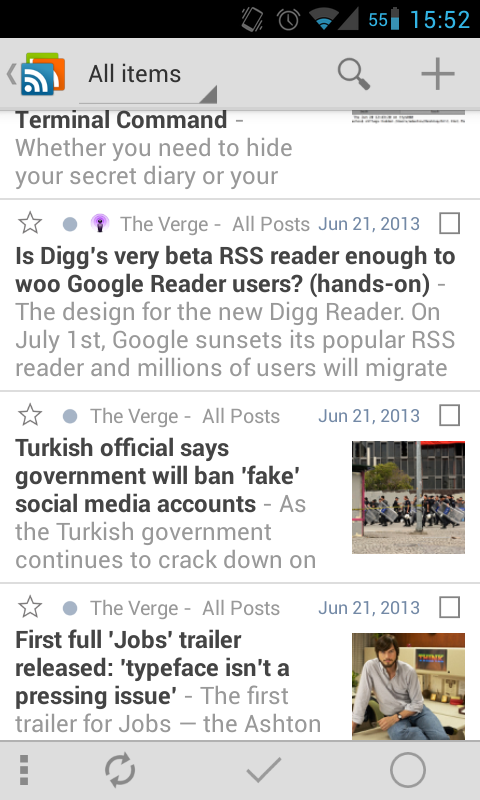 You can find more information on how to backup your Google Reader data through this link. So, keep that in mind, maybe try these two clients and in the meantime try to find something that works for you. See you next time and, as always, let us know of any suggestions or questions through the comment section!